Red Wheel ∕ Weiser Online Bookstore | Dr. Quantum's Little Book of Big Ideas: Where Science Meets Spirit by Fred Alan Wolf, Ph.D. It's a bird! It's a plane! No! It's Dr. Quantum - here to save your day with a book full of lively, mind-expanding, inspiring ideas. Respected among scientists and spiritual leaders alike for his pioneering work combining scientific and spiritual thought, Fred Alan Wolf (aka Dr. Quantum) is, as Deepak Chopra states, "one of the most important pioneers in the field of consciousness." Featured in the word-of-mouth indie hit, What the Bleep Do We Know? !, Dr. Wolf is a physicist who knows how to put complex science-based ideas into terms that even science-phobes can understand. With clarity and a sense of humor, Dr. Quantum presents Big Ideas in the form of both short quotes and longer excerpts and covers topics ranging from the construction of our everyday reality to our relationship to one another. 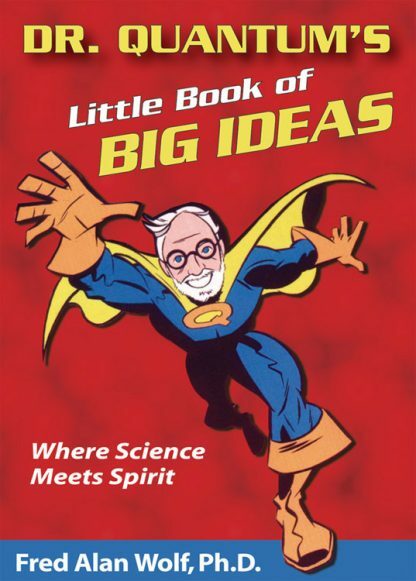 Dr. Quantum's Little Book of Big Ideas is a perfect gift for anyone interested in the realm where science meets spirit.